How Do I Unclog a Roof Vent? You might need to run a drain cleaner through your roof vent if it's clogged, or if this is the easiest way to access a clogged main drain. Slow draining and gurgling plumbing fixtures could be a sign of a clogged roof vent. And, on homes that do not have a main drain cleanout, accessing a clogged main drain through the roof vent could be your best option. Start by trying to clean the roof vent and main drain with a hand held drum auger. 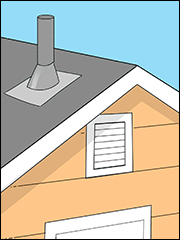 Important: before you attempt any work at roof height, take into account the accessibility and condition of the roof, the weather conditions, and any other factors that might complicate the job. Do not try this approach if you have no experience working on high ladders or aren't comfortable with the project. Avoid working on wet or snowy roof surfaces. You should wear rubber-soled boots or shoes, use ladders and other equipment that are in good condition, and use a roof harness if needed to assure your safety. And, if you're concerned about completing the job safely, consider hiring a licensed plumber to help. Start by feeding the auger a short distance into the vent to check for an obstruction close to the vent opening that you might be able to pull out. 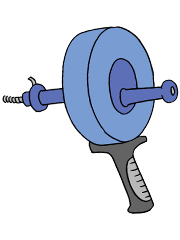 Next, try to feed the auger its full length int the vent stack, through to the main drain, by locking the cable, turning the drum in a clockwise direction, and then unlocking and feeding the cable as needed to pass the auger tip through any elbows and blockages. After you have inserted the drum auger its full length, pull out the auger cable as you feed it back into the drum. It may take several attempts to remove most of the blockage. Note: you can check if the clog has cleared by inserting a garden hose down into the vent opening, asking a helper on the ground to turn on the water, and seeing if the water flows freely down through the main drain. However, if the vent or main drain is still clogged, this could cause dirty fluid to flow out of indoor fixtures that are connected to the vent or drain. If there is unusually stubborn debris clogging the vent, or if the main drain is clogged, you might be able to flush out the debris with a sewer jetter. 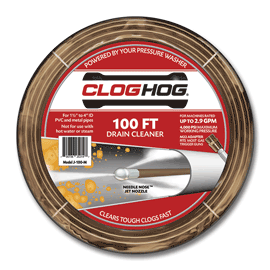 A Needle Nose™ drain cleaner is a sewer jetter with a tougher, braided steel jacket and a special compact nozzle tip that allows it to pass through almost as many pipe elbows and transitions as a hand-held auger. 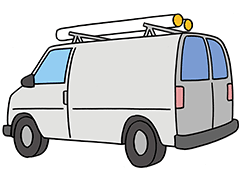 Note: you can read several success stories on our Customers Page from people who cleared a clogged main drain by feeding a sewer jetter through a roof vent. Important: you should consider using a sewer jetter to clean through to the main drain only if the hand held auger easily passed its full length through the stack, since the jetter cannot pass through as many elbows and transitions as the hand held auger. You will need help from someone on the ground to stay near the pressure washer, control the trigger, feed up the sewer jetter hose, and guide the hose to avoid snagging it on gutters, flashing, and other objects. Throughout the process you should carefully position the sewer jetter hose so that it cannot pull itself to the ground, being cautious not to trip or get snagged on the line as you move about the ladder and roof. Put on fluid resistant work gloves and eye protection, and then guide the nozzle at least a foot into the vent opening before you start the flow of water. 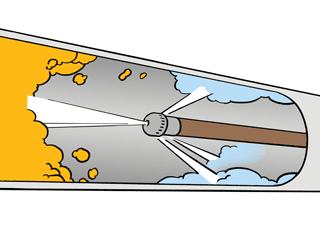 Guide the sewer jetter through the vent stack to the main drain as you squeeze the trigger. For more thorough cleaning, every few feet pull back about halfway and then continue moving forward. After you have finished cleaning the line, pull the drain cleaner out. Use care to stop the flow of water before the nozzle reaches the vent opening. To check for a cleared line, insert the garden hose down into the roof vent opening, ask a helper on the ground to turn on the water, and watch to see if water seems to be flowing freely into the main drain.